This spring has been another full and exciting season for Sinas Dramis Law Firm. Last Saturday we hosted our third and final Lids for Kids bike helmet giveaway of the year. To say the three events – held in Traverse City, Lansing, and Grand Rapids – were a success is an understatement. In case you missed it, here are some of our favorite 2018 highlights. 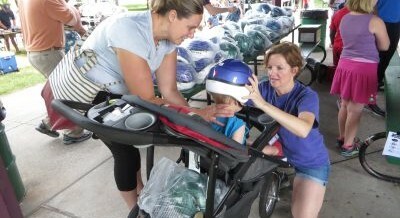 On Saturday, May 20, 2017 hundreds of mid-Michigan families came to the Lansing bike helmet giveaway — also known as “Lids for Kids” — to get free, properly fitted helmets for their children. In the end, 438 helmets were handed out at the Lansing Lids for Kids event. In turn, this means that 438 children now have a lesser chance of suffering a brain injury in a bicycle accident. 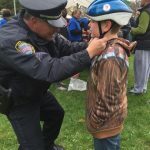 More than 260 free bike helmets were handed out at the 2017 Traverse City bike helmet giveaway — also known as “Lids for Kids.” The bike helmet and bicycle safety event was held Saturday, May 13, at F&M Park. Lids For Kids: 1,373 Bike Helmets Given Away In 2016! More than 1,300 Michigan children received, and were properly fitted with, free bike helmets this year through the Sinas Dramis Law Firm’s annual Lids for Kids program, helping to keep them safe from a bicycle-related head injury. Since beginning Lids for Kids more than a decade ago, our firm has given away and fitted 7,691 Michigan children with free bike helmets! Hundreds of Grand Rapids families came out on a hot and steamy day for our annual Lids for Kids bike helmet giveaway and bicycle safety event. 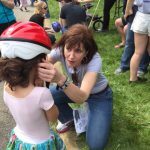 When all was said and done, 439 kids received a free, properly-fitted bike helmet at this year’s event, which was held June 11 at Garfield Park. The best news is that these children now have a lesser chance of sustaining a brain injury in a bike-related accident. Blue skies and sunshine brought out hundreds of families on Saturday, May 21, for the annual Lids for Kids bike helmet giveaway and bike safety event in Lansing. More than 500 children received a free, properly-fitted bike helmet at the 2016 Lids for Kids event. The best news? More than 500 Lansing-area kids now have a lesser chance of brain injury in a bicycle accident. 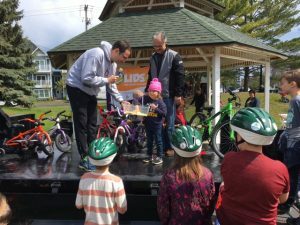 The weather was a bit chilly for the 2016 Lids for Kids bike helmet giveaway and bike safety event in Traverse City, but that didn’t keep families from attending. More than 400 kids were fitted with free bike helmets.